An ordinary bulb is an extremely energy inefficient form of lighting with just 5% of the electricity input converted to light. Efficient light bulbs like Light-emitting Diode(LEDs) consumes only one-tenth of energy used by ordinary bulb to provide the same or better light output. However, high cost of LEDs has been a barrier in adoption of such efficient lighting systems. The DELP on-bill financing scheme proposes to overcome this cost barrier. The main objective of Domestic Efficient Lighting Programme (DELP) is to promote efficient lighting, enhance awareness on using efficient equipment which reduce electricity bills and help preserve environment in India. The Electricity Distribution Company and Energy Efficiency Services Limited (EESL) a public sector body of Government of India are implementing the programme. The target is to replace 77 crore incandescent bulbs in the residential sector throughout the country with LEDs. 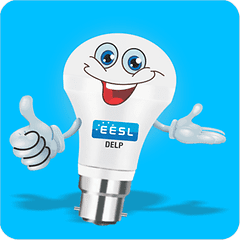 Government has announced that it distributed one crore LEDs in just 20 days under the Domestic Efficient Lighting Programme (DELP) and the total now stands at six crore bulbs. According to a statement issued today, EESL took only 20 days to cover one crore since the five crore milestone that was achieved in January. With the distribution of six crore bulbs, EESL has helped India avoid peak demand of 1,848 MW and an estimated energy savings of more than 2 crore kWh per day. The energy saving achieved converts to monetary savings of more than Rs 8 crore per day and has led to a CO2 emission reduction of over 17,352 tonnes per day, as reported by Business Today. You can visit their official website DELP to get the status of Total LEDs distributed as on today under this programme.